The ~ 115,000 km2 Volta Basin of Ghana is one of the most studied geological terrains. However, unlike the Birimian and Tarkwaian which have been targeted due to their gold potential, the Volta Basin has been studied largely only toward resolving its lithostratigraphic-related issues. The Volta Basin, however, has economic resource potentials that are worth exploring for the economic benefit of the country. This study seeks to highlight some of the economic resources of the Volta Basin that can be harnessed through further exploration and evaluation. Synthesis of the available literature on the economic resources of the Basin and some few field relations by the authors helped in unraveling the economic resource potential of the Basin. 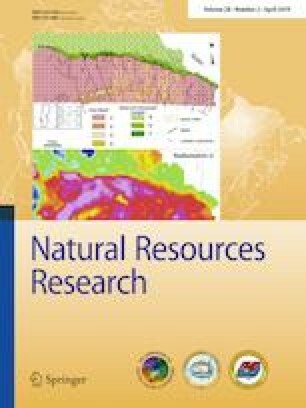 Previous mineral prospectivity maps for various identified minerals in the Basin were merged into a single large-scale map and overlaid on the geology of the area using GIS-based kriging interpolation method to outline the complete mineral resource potential of the Volta Basin. The study reveals that the northeastern, central, and southeastern fringes of the Basin have extensive exposures of sandstones that can be extracted and quarried for construction purposes. The Oti/Pendjari Group with a large areal extent coupled with a great thickness could be evaluated for brick and tiles production. The Group also has a wealth of limestones in the Mamprusi areas that could serve as a hub for cement production to serve all the northern parts of the country if exploited. The Basin could be hosting gold deposits via late hydrothermal fluids evidenced by quartz veins and the presence of extensive continuation of the Birimian structures into the overlying Volta Basin which are the main controlling features of the Birimian gold deposits. The Basin hosts phosphate, bauxite, diamond and iron ore deposits in some localities. Out of these, only iron ore discovered in the Sheini area is currently under exploration but is being constrained by several geological factors. Although Premuasi 1 well has not given promising results on the hydrocarbon potential of the Basin, the lithostratigraphic succession of the basin supports a complete hydrocarbon system just like the Taodeni Basin. The second author acknowledges the continuous support from the Scientific and Technological Research Council of Turkey (TÜBİTAK) as a doctoral fellow of BIDEB 2215 Graduate Scholarship Program for International Students.